No sooner has Disney taken over Fox, President Trump’s favourite new bringer, than a terrifying talking Donald Trump robot debuts at Disney World. 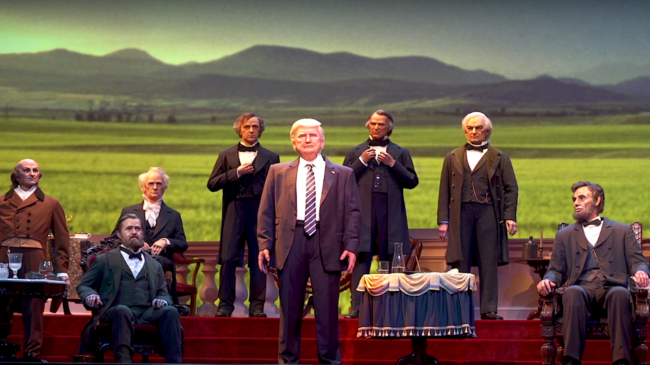 TrumpBot stands alongside other American presidents, like Abraham Lincoln, Barack Obama, and George Washington. All can be seen at the Mouse House’s Hall of Presidents. Mickey Mouse Presidents, you say? Mickey Mouse is defined by the Urban Dictionary as: “Substandard, poorly executed or organized. Amateurish.” Bit harsh.